When I think of rumbling, thunder comes to mind. It is nature’s way of waking us up to smell the coffee and then move on! Rumble was a German Shepherd that I met today. He was old like his master, but still wanted to take a swim in the pond near a park that I frequent. Is there a reason that when we get older, we still want to do the same things, but maybe we cannot do exactly what we used to do, and that is the way it is? Rumble the dog wanted to swim today, but his friend had other plans. 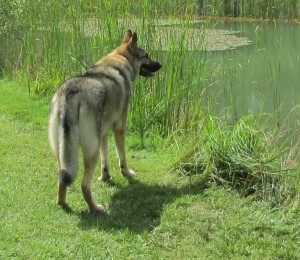 And Rumble listened and did not enter the water, just stared at it intent on a nice swim. He came up to me to get a pet and wanted to leave with me, but he obeyed and stayed with his friend. Even Rumble was looking for a new adventure. I love animals and would have gladly taken him home. What is it that we want to do? Is it something that is a reasonable goal, or are you still thinking about some of the things you did not finish, or something challenging that you never did? Find yourself in meaningful moments. I did not think that I would meet anyone on my way to the park today, but I made two friends. The perfect picture at the park today. Nature is so very kind to us. Take a long look as you stroll through life. Begin to accept that you are aging, and you may need to re-focus on some of your goals and dreams. Accepting things the way they are in the moment seems simple but it needs some practice. This entry was posted on Thursday, August 1st, 2013 at 4:03 pm	and is filed under Accepting Change. You can follow any responses to this entry through the RSS 2.0 feed. You can leave a response, or trackback from your own site.